Surface mount on the transom on the lowest possible location, about 3" above the bottom of the boat. Please make sure the inside of the transom is clear. Lighting unit comes with 2M installation PU wire. Light and wiring box are separate parts for added security. Light is dimmable. It is a low heat emitting light and is designed for the harshest conditions underwater. Add this light to your boat to enhance and increase safety for night activities, swimming, loading and unloading activities and it encourages marine creatures to swim toward it. It is waterproof IP68 rating. 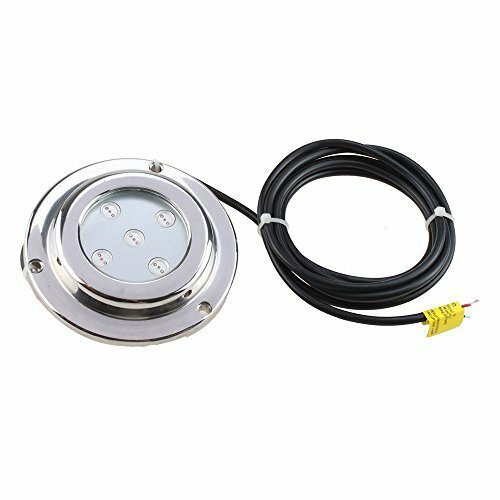 Applications: It can be used for the yacht outline lighting, underwater illumination, swimming pool lighting, boat interior lighting and so on. Note: The LED underwater light can only be operated under the water! WATERPROOF & SHOCKPROOF: The housing is made of 316 stainless steel material which has great anti-corrosive effect. The shell surface is chrome plated that not only bright the glossiness but also further enhances corrosion resistance and wear resistance.It will not effect by engine movement, so you can use it when cruising. GREAT LIGHTING: 5 high power 1W CREE LED lamps contribute to total 5W lighting. 180¡ãviewing angle, luminous flux 270Lm. GOOD HEAT RADIATION: Aluminum housing and titanium alloy plated form a good cooling system to protect the light and extend the serve time. WIDE USAGE RANGE: You can use the lights in many ways, such as night fishing, night fishing, lighting up your wave when underway and creating good effect in your boat. CONVENIENCE: 3 holds are easy to set up. HIGH QUALITY: The lights go through shell molding, polishing, electroplating and other procedures. In each procedure, we pick up the best one into the next round of processing.